I can almost taste the cherry popsicle and see the cherry red smile. Adorable and perfect for summertime. I have this fabric in another color way. Something like this could make it to the que for summer. We will see. Were you watching? I was. I was very happy with the result. I sure hope the "former paint salesman" moniker can be dropped now. Poor guy, he is more than a paint salesman. I watched and was happy for Lee, he was so happy. His comment made me cry when he said he had never felt happiness before. God LOVE HIM!. I love your little dress. I wish Crystal had one because she is just so amazingly gifted but I am sure her career will be fabulous too. 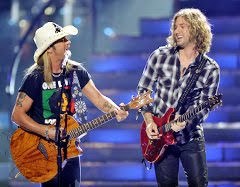 And I agree about the Casey/Brett duet. I think it would have been so cool for Brett and Crystal to have sung together though. You know, kind of slapping Type 1 diabetes in the face, since they are both strong survivors of the disease like my India. It made me cry to see Brett looking so healthy after his recent health issues. Thanks for showing it to us with the link as to where we could buy it. By the way, you won an award. Drop by http://stresstheseams.blogspot.com/2010/05/10-things-i-need-to-share-because.html to check it out! 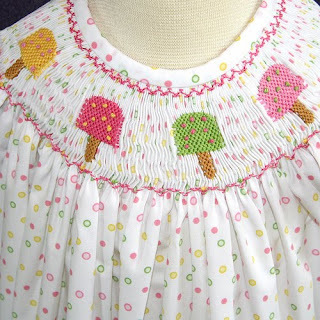 Love the smocking. Can we see the whole dress? I'm in the mood for a pop cycle now!!!! Yummy dress! I am in 100% agreement with you about AI! Cute and fun dress! Thanks for the inspiration Martha!